This is a great opportunity to meet with your peers to discuss the latest trends, best practices, and technology! You'll find all the latest updates from VMware and VMUG, sessions from our sponsors and great community content too. If three busy rooms across the whole day is not enough for you, then please join us for further conversation and networking opportunities at our now traditional follow-on 'Luxury vBeers' event. Chris Porter: Kubernetes - The Sysadmins Ticket Onboard the DevOps Voyage. Kubernetes looks like it is going to be one of those SysAdmin Survival Skills. Join Virtual Design Master Chris Porter on a voyage of discovery. Dave Simpson moderates a discussion around all things certification, featuring panelists who either can't do enough certifications or have simply let those 'your cert will lapse' dates pass them by. Bring your questions and opinions! vSAN has grown faster than any other hyper-converged solution out there. Are you curious how it all began, but more importantly how it may evolve in the upcoming years? Duncan will talk through the history and current state of vSAN, and then demonstrate where vSAN may be evolving in the upcoming releases. They're back! The authors of the VMware vSphere 6.5 Host Resources Deep Dive, which launched pretty much at the Summer LonVMUG last year are back with a preview session on content they hope to deliver at VMworld 2018. We graciously thank our Gold sponsor Blue Medora and our Silver sponsors IGEL Technology and Login VSI for their support of London VMUG. What is your endpoint strategy? Hear IGEL’s Steve Wilson discuss IGEL’s revolutionary endpoint management solutions, simple, smart and secure. We believe it should be as easy to remotely manage 10,000 devices as 10 and add the functionality that’s most important to enterprise, making the life of the IT department easier. See how easy it is to transform your assets with IGELs Universal Desktop Converter – enabling you to repurpose your old x86 device into an IGEL Linux based thin client within minutes. The UD Pocket provides a portable thin client – perfect for today’s BYOD work environments. It’s not about the hardware, it’s never been about the hardware, today more than ever it’s about the software. As this is our LonVMUG Summer meeting, we like to round off the day in style with Luxury vBeers. This year we're relocating for an evening at Anspach & Hobday, 118 Druid St, London SE1 2HH, which is at the City end of Bermondsey, 10 minutes walk from Bermondsey underground station (Jubilee Line) and closer to Tower Bridge and the Shard than we've been previously. 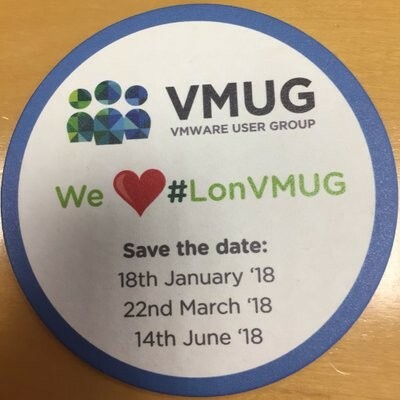 This will be a limited capacity event, with tickets handed out during the day at LonVMUG. All done by 9PM, so you'll have plenty of time to get home before you turn into pumpkin.